"What would make Kingsborough park a better place?" The concept plan and recommendations below incorporate insightful contributions from the community. Located at the intersections of West Ellendale Avenue and SW Wyatt Street, Kingsborough Park is classified as a Neighborhood Park. The park is located within walking distance of Rickreall Creek, but currently has no formalized path to connect visitors to the creek or the Rickreall Creek Trail System. The park’s nine acres are currently underutilized. Collaborating with members of the Turner Parks Project Advisory Committee, Community Planning Workshop assembled the following program of capital projects to be added to the existing park site. • Large picnic shelter to accommodate 20 users. • New playground equipment with shade sails. • Boardwalk spanning across the detention basin. • Athletic fields to accommodate two under-12 soccer fields or up to four under-8 soccer fields. • A concrete loop walking/jogging path that connects to the western bridge. • Fitness stations arranged along the concrete path. • Posts added to allow pickleball or tennis nets to convert the existing basketball court into multi-use court. • Mix of deciduous and evergreen tree plantings throughout the park. 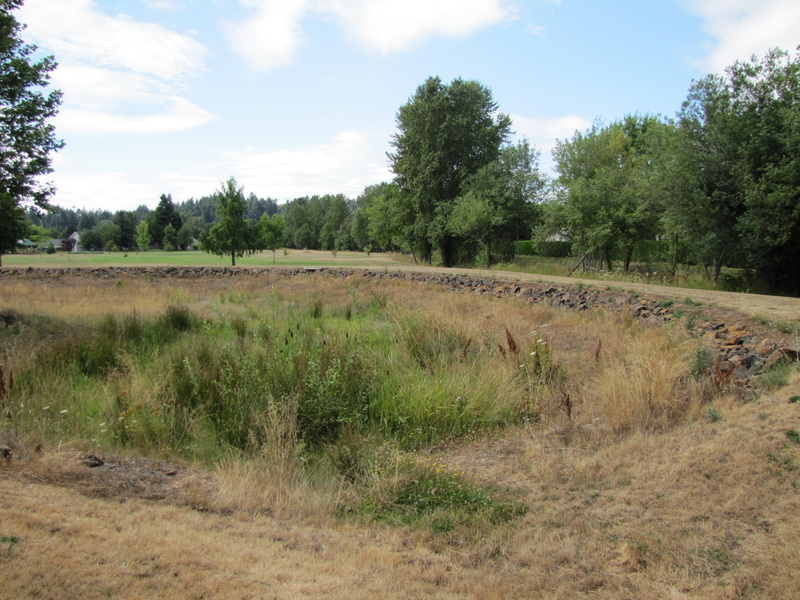 • Wildflower planting in detention basin. • Temporary tree plantings in undeveloped lots across Wyatt Street. • Gently sloped berm between athletic fields and drainage swale. • Picnic tables beneath the new picnic shelter and other non-covered tables near the playground. 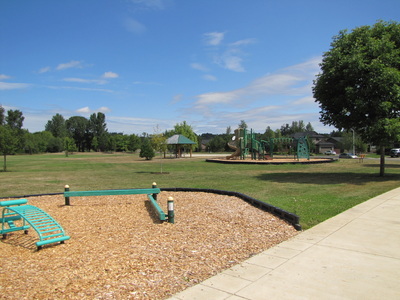 • Benches along the walking path and near the playground area. • Directional signage along W. Ellendale Ave, 1/4 mile north and south of the park directing potential visitors to the park. • Welcome signage at park entry points. 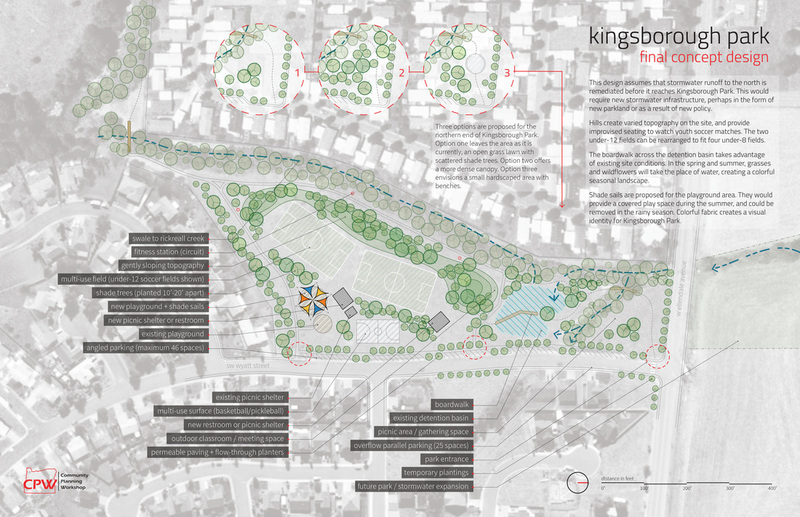 Download a .pdf file of the Kingsborough Park concept design by clicking here. This design assumes that stormwater runoff to the north is remediated before it reaches Kingsborough Park. This would require new stormwater infrastructure, perhaps in the form of new parkland or as a result of new policy. Hills create varied topography on the site, and provide informal seating to watch youth soccer matches. The two under-12 fields can be rearranged to fit four under-eight fields. 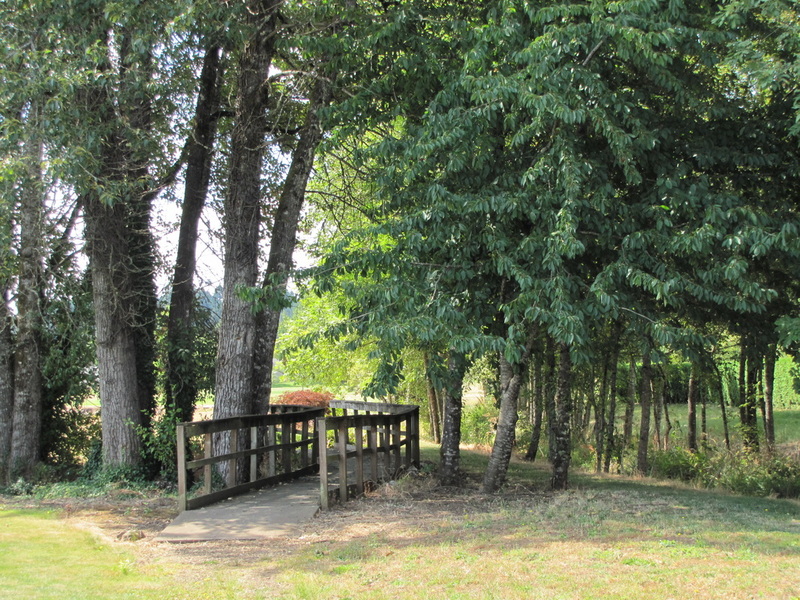 The boardwalk across the detention basin takes advantage of existing site conditions. In the spring and summer, grasses and wildflowers will take the place of water, creating a colorful seasonal landscape. 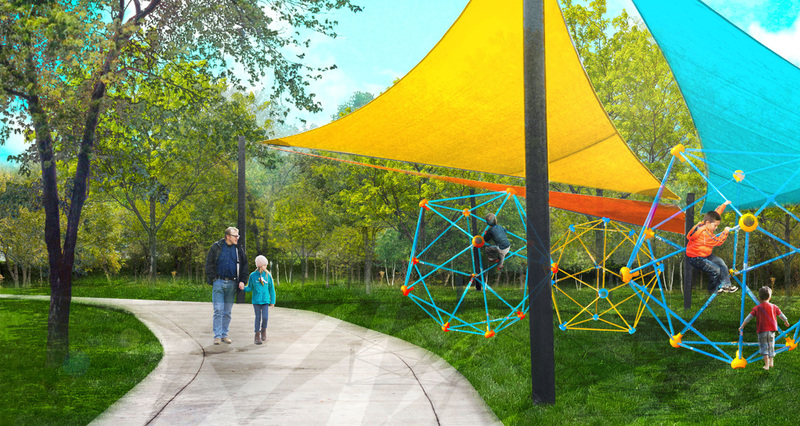 Shade sails are proposed for the playground area. They would provide a covered play space during the summer, and could be removed in the rainy season. Colorful fabric creates a visual identity for Kingsborough Park. (1) The first option leaves the area as it is currently, an open grass lawn with scattered shade trees. (2) The second option offers a more dense canopy. (3) The third option envisions a small hardscaped area with benches.